Brda Moore scored for Phantoms against former club Hull. Planet Ice was the scene of a sporting massacre last night (January 21) as Peterborough Phantoms breezed to their biggest victory of the season. While a 13-1 annihilation of hopeless Hull spoke volumes about the terrific shape that the city club are in, it did little to demonstrate the competitiveness of the second tier of the sport. Sam Towner scored for Phantoms against former club Hull. Even allowing for the visiting Pirates being weakened by injuries and suspension to key forwards, a 12-goal winning margin in a clash between sides sitting third and fifth in the standings could not have been foreseen. And, let’s be honest, it should not happen. The higher-placed Phantoms took to the ice six points better off than their visitors after two-thirds of the regular season. It’s safe to say the gulf was considerably bigger than that on the ice. “Hull are going through a tough time,” said Phantoms coach Slava Koulikov. “They have changed some players and got knocked out of the cup at the semi-final stage. “Their morale won’t be high and they were really short-staffed, but we just had to take care of our business. James Archer scored for Phantoms against Hull. Ales Padelek launched the onslaught after just 92 seconds and Brad Moore soon added a second. That was, no doubt, a moment of huge satisfaction after he started the season in Hull, but departed due to a lack of ice time. A further five Phantoms goals arrived in the second period with Martins Susters, James Archer, Tom Norton, Wehebe Darge and Sam Towner (another former Hull man) getting on the scoresheet. Darge struck during a five-minute powerplay that following the ejection of Hull defenceman Martin Ondrej. The Slovakian import got exactly what he deserved for a check to the head on Phantoms youngster Callum Medcalf – an ignorant and cowardly act that left the victim dazed and unable to continue. The final goal of the middle session, when Towner darted in unassisted after pinching the puck, sparked the exit of Hull’s new import netminder. Czech veteran Vlastimil Lakosil is enduring a miserable start to life in the EPL. He conceded eight times during his midweek debut as the Pirates’ were beaten at Milton Keynes in the second leg of an EPL Cup semi-final and leaked a further seven last night. Rookie replacement Ashley Smith fared no better as he failed to stop six of the 16 shots he faced. That half-dozen all arrived in the final period with Darius Pliskauskas helping himself to a quick brace before Susters fired Phantoms into double figures with his second of the night. And they didn’t stop there. Padelek and Towner both doubled up as they struck 19 seconds apart before Hull bagged a consolation. Andrew Hirst’s effort drew sympathetic applause from all sides of the arena, but dashed hopes of a shared shut-out for Phantoms’ two netminders with Adam Long having replaced Janis Auzins just before the mid-point of the contest. But there was still time for another home goal as Conor Pollard struck at EPL level for the first time while twin, Nathan, claimed his second assist of the night. The Pollards, who are Islanders regulars, were one of three sets of local brothers to feature for Phantoms last night along with the Ferraras (James and Robbie) and the Longs (Adam and Nathan). On occasions during the third period, Phantoms also iced an all local line-up with the likes of James White and Moore also featuring along with the aforementioned siblings. 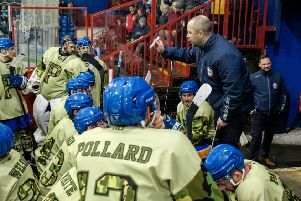 Koulikov added: “We were also able to give ice-time to plenty of guys from Islanders, which is something that is very important to us, and also use both of our netminders. “I’m not sure whether or not it is the ideal preparation for a big semi-final – I guess we’ll find out tomorrow! Phantoms look set for a considerably tougher assignment tonight (January 22) when they travel to Telford (6pm) for the second leg of an EPL Cup semi-final. The city men triumphed 4-2 in the opening clash at Planet Ice last Wednesday to collect two points. That means a draw in Shropshire would be enough to clinch a final spot.